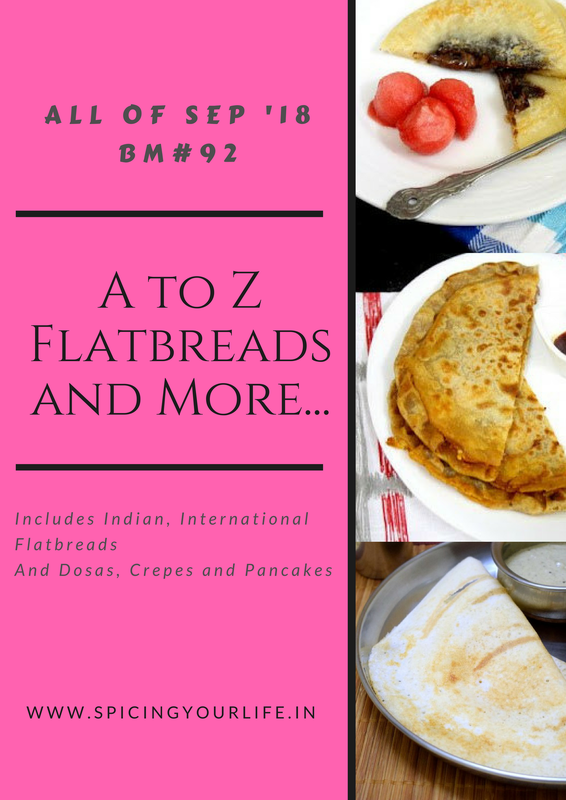 We are nearing the end of the A-Z flat bread series and all the tough/tricky alphabets are coming around!I was in a fix when it came to W.We have Warqi paratha but it sounded a bit laborious. So I opted for this Winter Melon Paratha Recipe when I ran out of ideas for this alphabet! Winter melon / White pumpkin/ Wax gourd / Vellai pusanikai is a nutritious vegetable and I have added this in the paratha dough.This makes it a deliciously flavored and filling flatbread. Add water little by little and knead to a non sticky dough. Pinch out small balls of dough and roll it out into a circle. Dust a little flour on the board if needed. Cook on a heated griddle till brown spots appear on both sides. Remove from griddle and repeat for the remaining dough. Ultimate pick for W PJ.. Well done yaar. Wintermelon parathas looks excellent to have with some spicy side dish without any fuss. Love adding veggies in paratha dough like this. Inviting platter there. This is a good pick, PJ. I shall try this PJ. I was thinking water melon rind but settled with warqi paratha. Winter melon paratha , sounds very interesting , you have come up with some amazing paratha s PJ . Vey unique and interesting . The thought process to find different parathas fitting in the alphabetical slot is a great achievement and must say you have rocked . This is such a healthy paratha recipe. Even I used winter melon for today’s recipe. This is a wonderful way to sneak in the veggies for kids. Great and healthy paratha recipe with W.
This is such a healthy pick PJ, I know adding it to the dough must have made it so soft and yummy!..good pick for the letter. A nice healthy way to begin the day with some winter melon parathas. Lovely share for a difficult letter. Wow what a pick for the letter. Paratha looks yum and delicious. another watermelon rind recipe after srivalli’ dosa. I loved this watermelon paratha. having aroma of watermelon will give a nice kick to paratha. Lovely recipe using poosinikkai. I have hardly made anything other than sambhar or kootu with it. This is something I will try next time I buys some. That is such a fabulous idea PJ…this would be a great way to get kiddo to eat pushnikai. The parathas look so soft and yum!! Superb choice! !